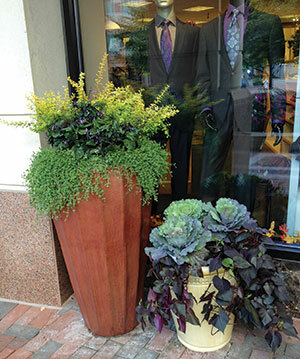 With seasonal containers, a Virginia-based landscape firm finds work styling the exterior of a boutique. 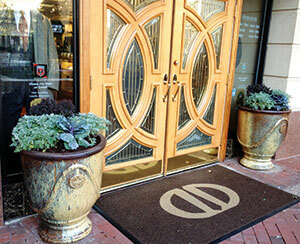 When a high-end clothier showed interest in a new storefront plant display, it led to a new account for Kane Landscapes, a Potomac Falls, Va.-based landscape company. 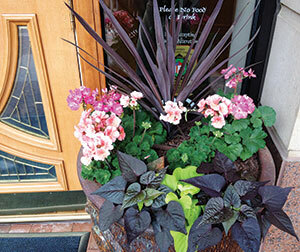 While it was the company’s first seasonal color change-out job for a commercial client, the mostly residential company found enhancing storefronts is similar to performing container gardening services for homeowners. The entire project came about when landscape designer Amanda Hamilton was attending a professional networking meeting and met a fellow attendee whose father owned a high-end boutique. He was looking for a way to make his storefront pop. While the upscale shopping center already had a landscape company handling plant change-outs in common areas, the shop owner was looking for something that would set it apart. Hamilton says it takes approximately an hour for her and another manager to do the actual plant change-out, so she accounted for that time plus design time when she priced the job. She also set a bimonthly budget of $300 for the material itself. Instead of discarding the old, brown urns that were previously used for the storefront, Hamilton says she cleaned them up and installed interior plant material. The urns now are on display inside the store. A store employee is responsible for watering both the indoor and outdoor containers. Adding this service didn’t require much investment because Kane already handled residential container gardens and had the necessary tools. The biggest difference for this job involves transporting the materials to the site. Kane Landscapes finds enhancing storefronts is similar to performing container gardening services for homeowners. To contain dirt, Hamilton says, workers put out tarps when they perform the change-outs. “Handling a storefront as opposed to a residential property definitely required a little more caution in containing the mess,” she says. The store has been happy with its new storefront designs. In fact, it recently renewed its contract with Kane Landscapes. Pricing: Materials and time for design and installation. Biggest challenge: Mid-winter is a difficult time to do a container garden because there’s limited plant material to choose from. Landscape designer Amanda Hamilton says evergreen grasses and colorful cabbage are one way to retain color.